We can avoid duplicate values storing in table when we insert data to table. Because the duplicate entry is one of the main problem, while insert data into mysql table . We removed duplicate values using 'DISTINCT' key in mysql query, if it is present in table. We can check whether the value is present in table or not using PHP and Mysql before add data to table. We can also avoid duplicate values storing in mysql table while inserting by primary key. Now you try to add name 'guru' again. You can check whether the name 'guru' is present in table or not using below PHP script. mysql_query() - execute the query and select if any similar values are present in table. mysql_num_rows() - returns numeric value of selected rows. If its value is 0, then there is no similar values present in table. Otherwise the value is already present in table. you can also use mysql_fetch_row() instead of mysql_num_rows(). If the value is present in table, it could not be stored in table. Now you can avoid duplicate entries in table using PHP and Mysql. 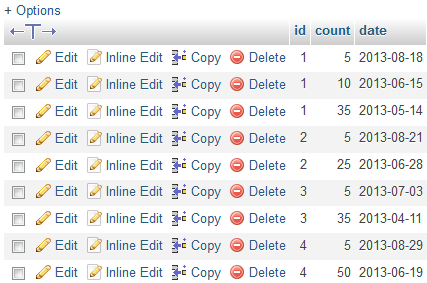 You can see the column 'id' values in mysql table 'table1' are unique. The id value 1 are present 1st, 2nd and 5th row. But it takes only the first row. - The column 'id' got the first preference to group. - Then the column 'count' is grouped. 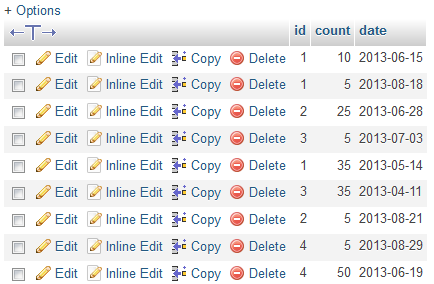 You can see the mysql table 'table1' which is grouped by both id and count. But you can't the get unique values in both mysql columns.